A small, ornamental grass native to the wet, rocky cliffs of Japan's Honshu Island, including the area around Mount Hakone, after which the species is named. 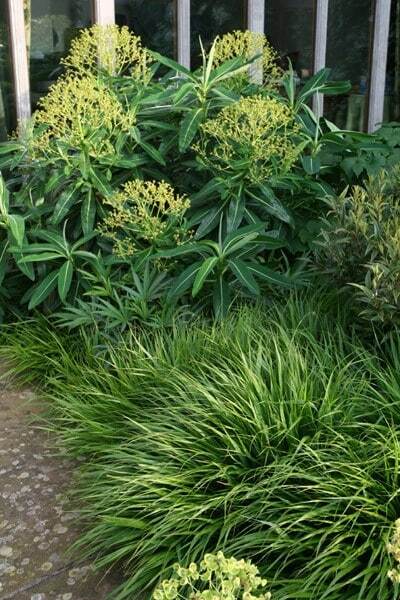 It is a slow spreading grass which builds into gently cascading hummocks of bright green that are useful as a simple understorey to light shrubs and as a soft edging to paths or steps. Fine, light sprays of lime green flowers appear during June and July, giving a billowing lightness to planted drifts. The clean, minimalist style of this grass makes it a good choice for formal courtyards or in minimalist urban planters and the fresh green foliage gradually acquires rich russet tones as autumn advances. I liked the picture in the catalogue of this grass. I have long, stone edged borders and it looks good overhanging them. I have ordered more. Fabulous grass, my favourite Easy to grow, plant and forget! It improves over a few years forming a lovely compact clump which has an arching habit. Bright green in spring and summer and this year spectacular autumn colours. It' looks great by a pond where it caresses the water surface and has a lovely reflection. Can t have enough of these in the garden. It also looks lovely as a feature plant in a pot. Beautiful Japanese grass, my favorite. The luscious grass is much admired - both in the full flush of summer green and as autumn colour. Cut back hard in February, it seems to come back stronger every year. Looks at its best when the wind moves its slender leaves like the waves of the sea. Elegantly cascading grass, lovely as edging or grouping under deciduous plants. Wonderful autumnal colour. Looks great in pots too. Hi I bought 3 of these plants and have had them over 5 years. I tend to cut them back in spring as I begin to see new shoots. I have not divided any of them. Every year they have become smaller and smaller and 2 of them have nearly died completly. I mulch well. What am I doing wrong? Is there anything I could to emcourage growth, as I'm thinking of buying some more - as they look lovely. Hello, These plants love a reliable source of moisture, so it is important to make sure they do not dry out. Also, they like nutrient-rich soil, so make sure when you mulch, you use something like a composted organic manure.